When it comes to colour matters, purple is associated with nobility and magnificence. 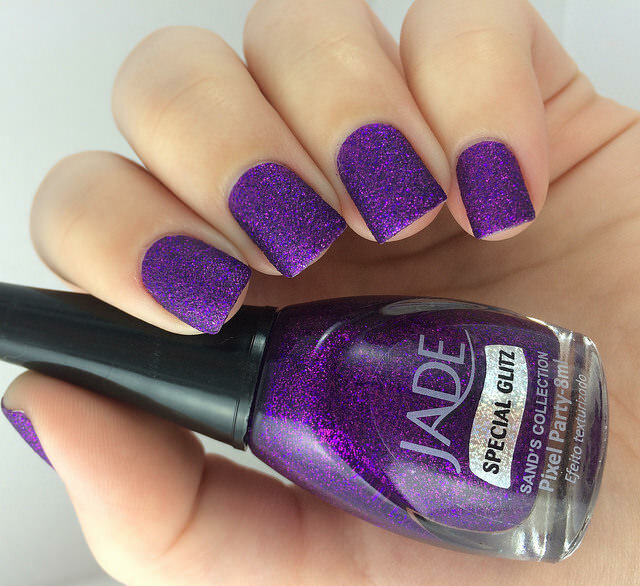 Adorning yourself in purple nails is a strong indication that you are bold, elegant and not afraid of attracting attention from the mob. 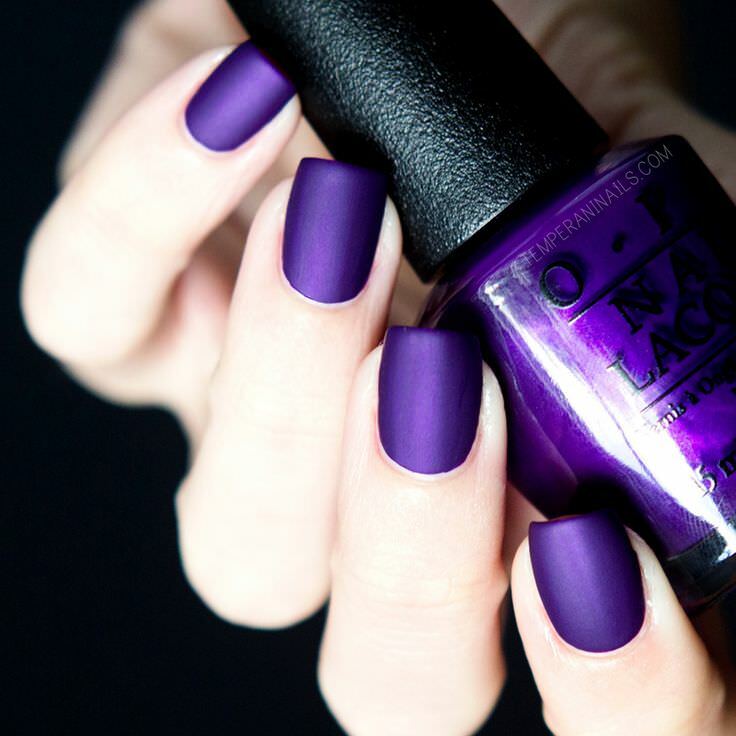 Purple is considered one of the conventional nail polishes known in the fashion and design of nails. Light purple is especially a nice pick for feminine nail designs. Add a bit of sparkle to your nails this time of the year. Purple nail paint topped with golden sparkles is a combination which is fail-proof. This one goes very well with the uber-chic party look. 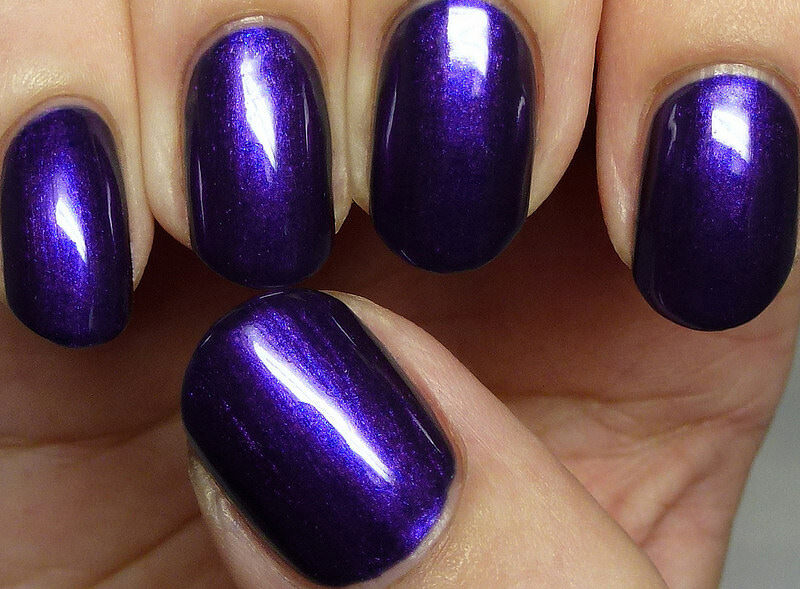 Spread some deep dark purple onto your nails and top it with some silver paint to accentuate the effect. You simple cannot go wrong with this combination! 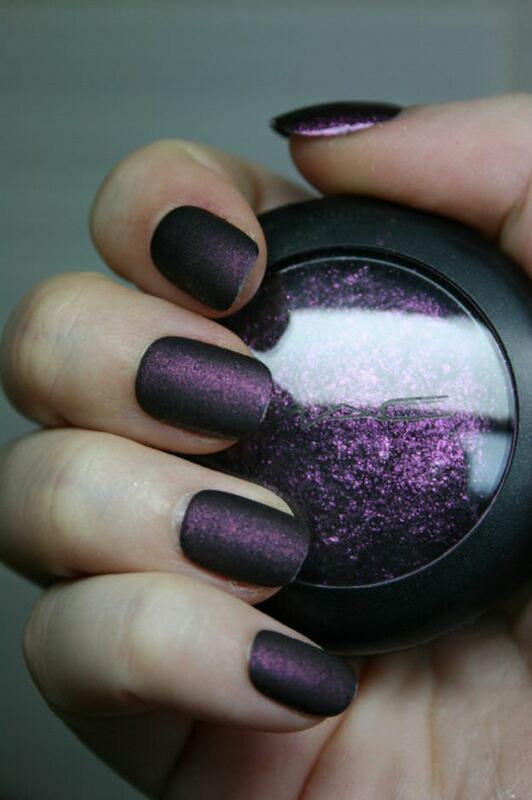 Up the attractiveness of your nails by employing purple sand glitter for the job. 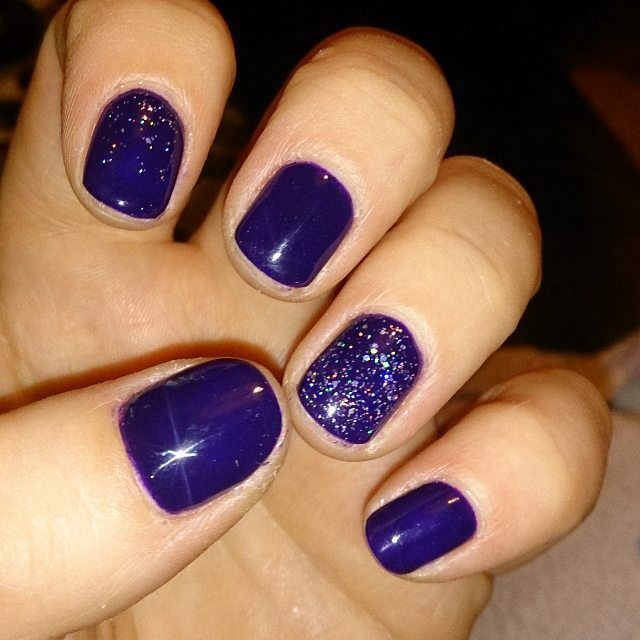 Apply a dash of this purple nail paint and marry it with same color glitter – a shade lighter or darker, your choice. This one’s a surefire hit. Want to flaunt your short nails fashionably? 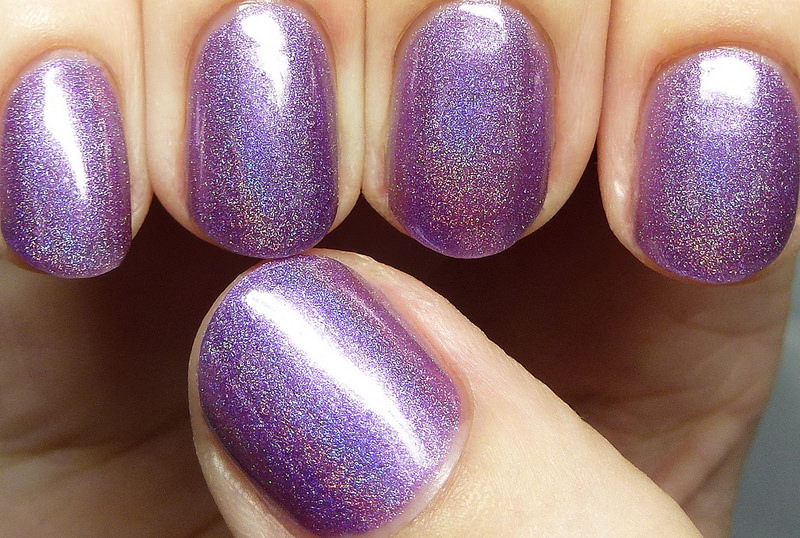 Take the glittery route for your nails and pick little purple glittery nail paint for your next manicure. 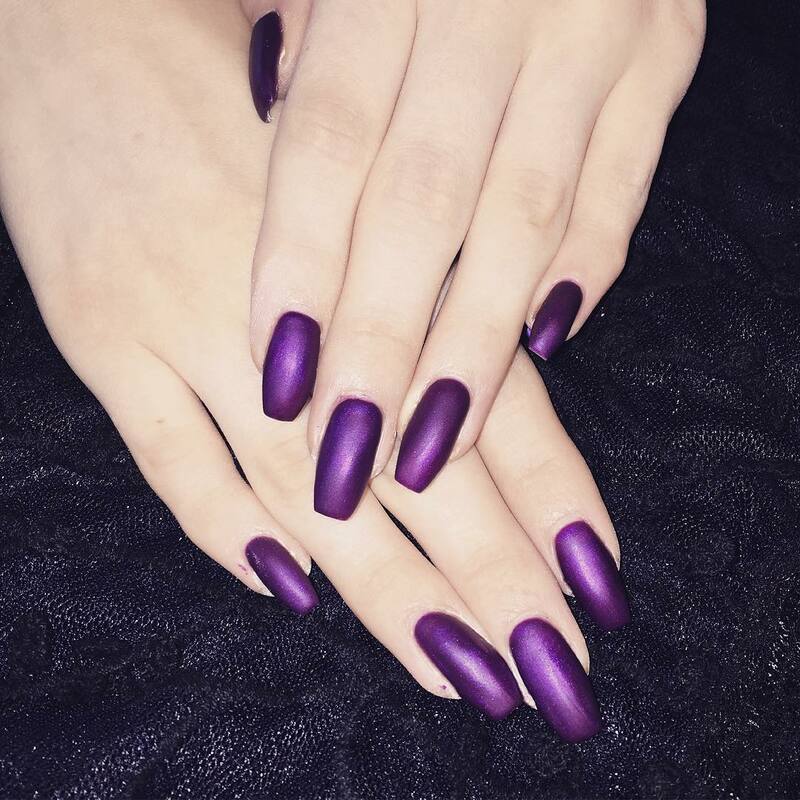 A stroke of dark purple of your nails is sure to make heads turn wherever you go. Apart from being bold, the darker shade of purple is a fashion statement this season. 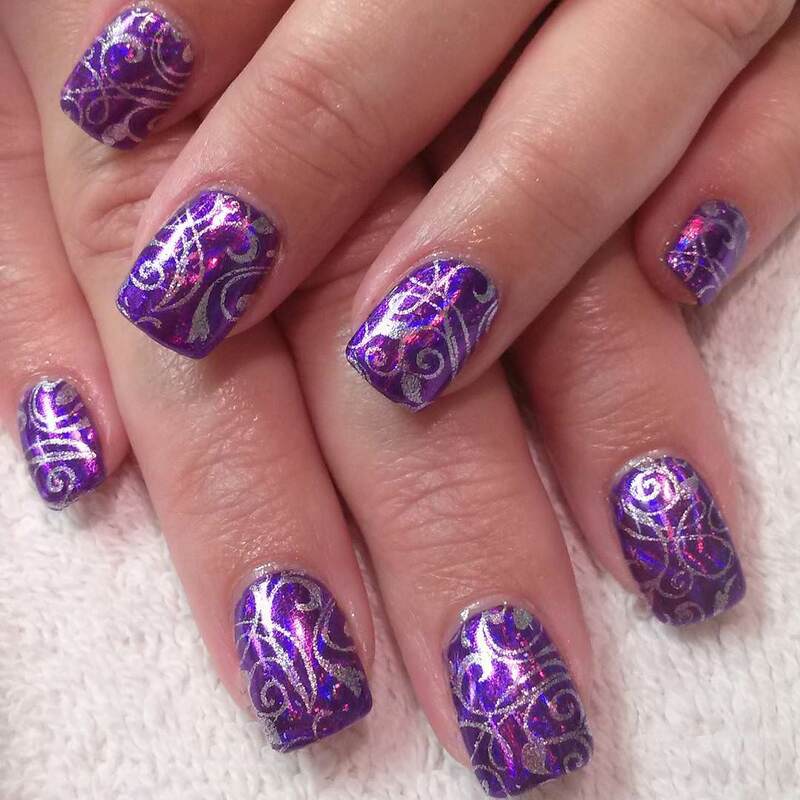 If you love dark purple and want to keep it simple, then you can simply paint some simple purple nail art – patterns mostly. Whatever you do, keep it stylish and classy! Add another dimension of attractiveness to your nails and enhance the visual impact. Pick a matte nail color and paint your nails right away! Totally awesome! Overlaying purple French tips on a silver line can be a distinctive tweak on the archetypal nail designs. This design can be made even more intricate and unique by incorporating befitting lines in a colour of your choice originating from the corner of the nail. 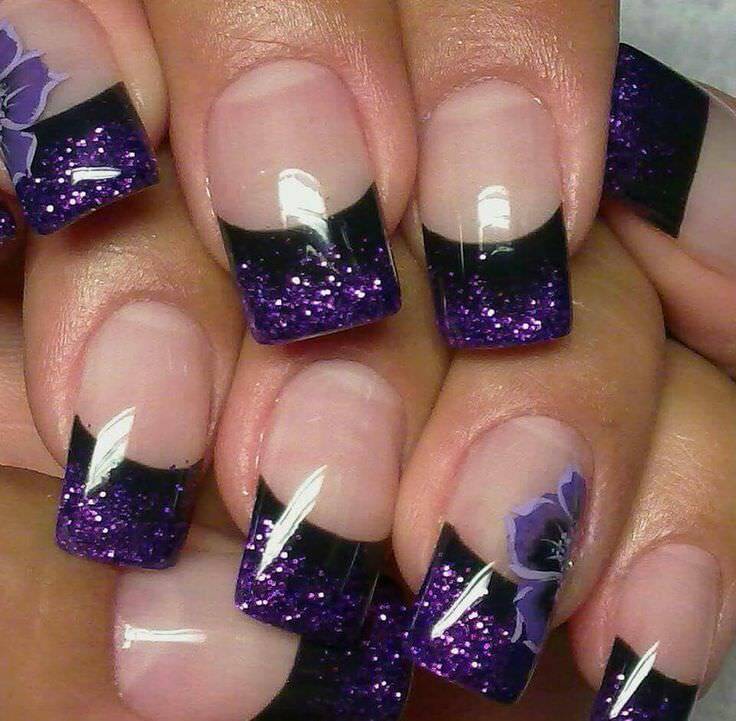 Alternatively, donning black French tips with the rest of the nail polished purple can be an impressive design. 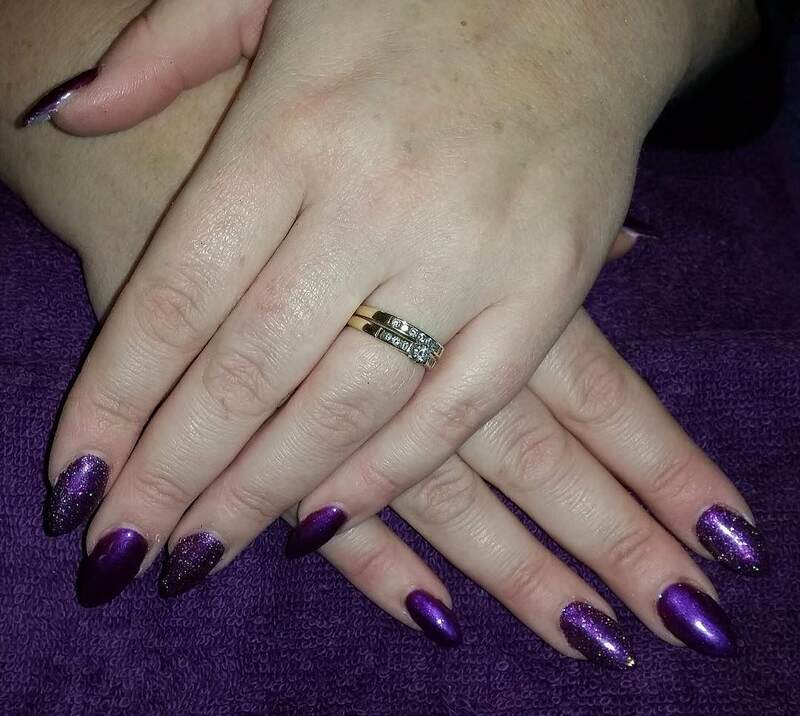 If you love metallic nail designs then you shouldn’t miss out on getting a stylish metallic coat of purple done on your nails. 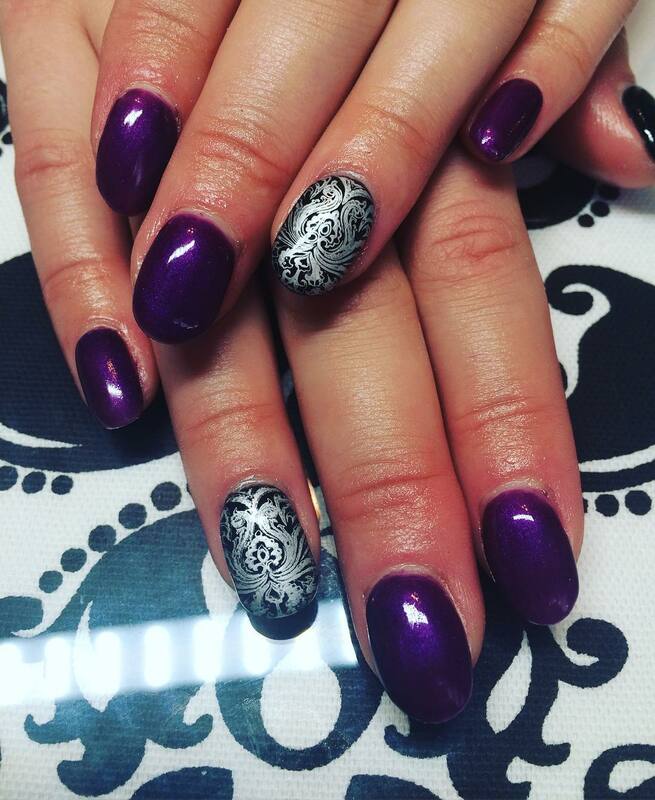 Black and Purple Nail designs have always been a style statement. Deck up your nails this season using some neon purple nail paint, and combine with black acrylic to make interesting petal design. The almond nail shape is very much in vogue now. 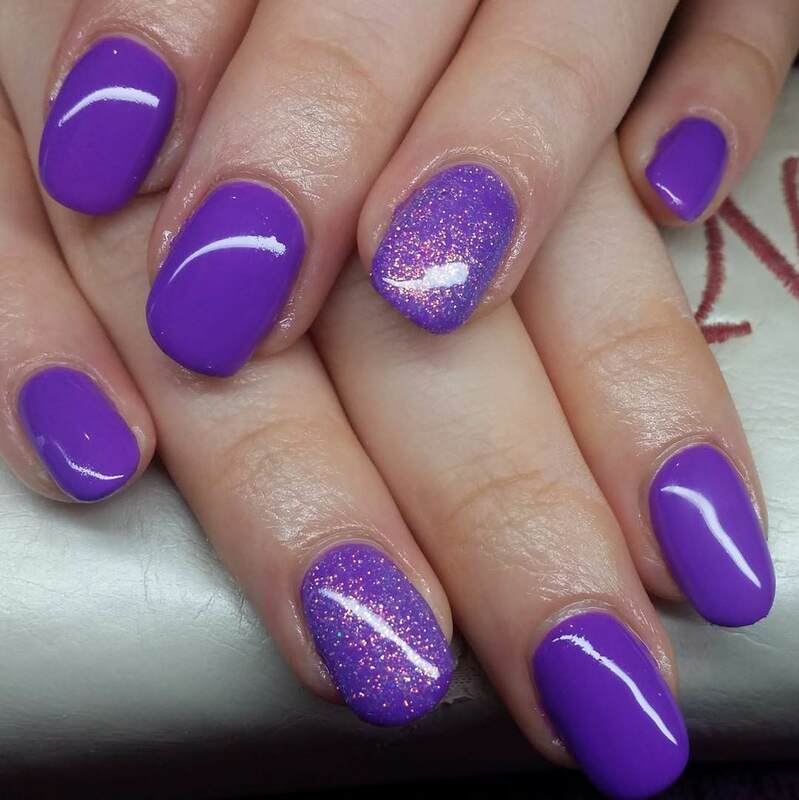 Almond Purple Nail Designs are trending very highly these days. Time to get a fresh coat then? Checked nails can be quite spectacular. Segment each nail into four checkers then lacquer the diagonal squares with the same pigment – use a darker hue of purple for one of the diagonal pair and a lighter one for the other diagonal. Strips are one of the simplest nail designs that can be done by everyone. 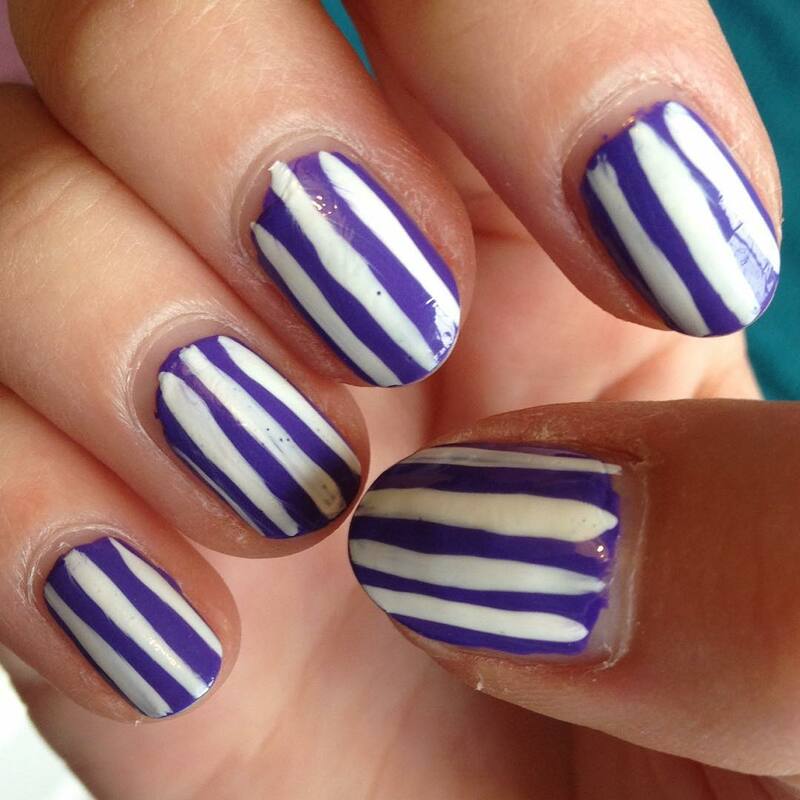 However, you can refine this design by fashioning the strips in a wavelike manner using varying hues of purple. 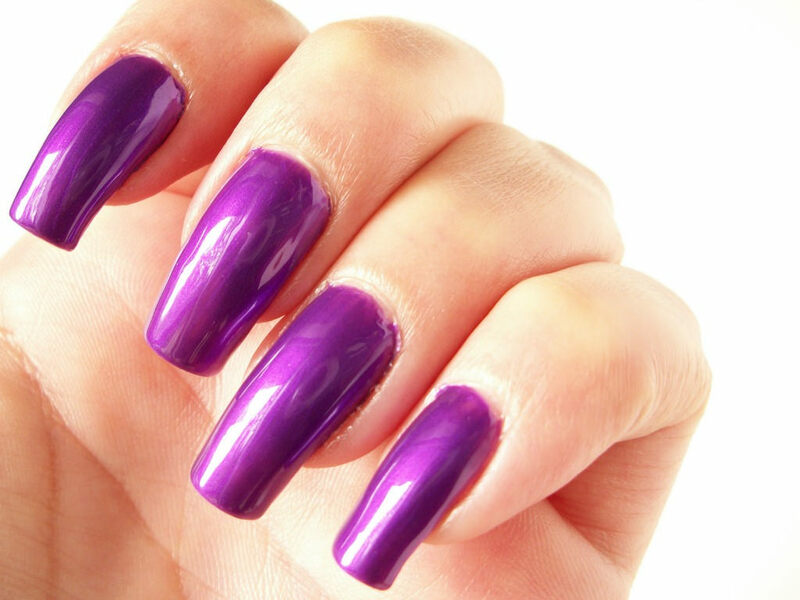 Purple and One More: A fashion fad which has picked up these days is coloring your nails with alternate colors. What goes well with purple then? All colors, literally. Popular recommendation is purple and white or purple and black. Zigzag Nail Art: Use two nail colors. Pair purple with another color and paint as though both colors are fading into each other. And then on one nail use both the colors to create a zigzag pattern. Your nails will definitely stand out. 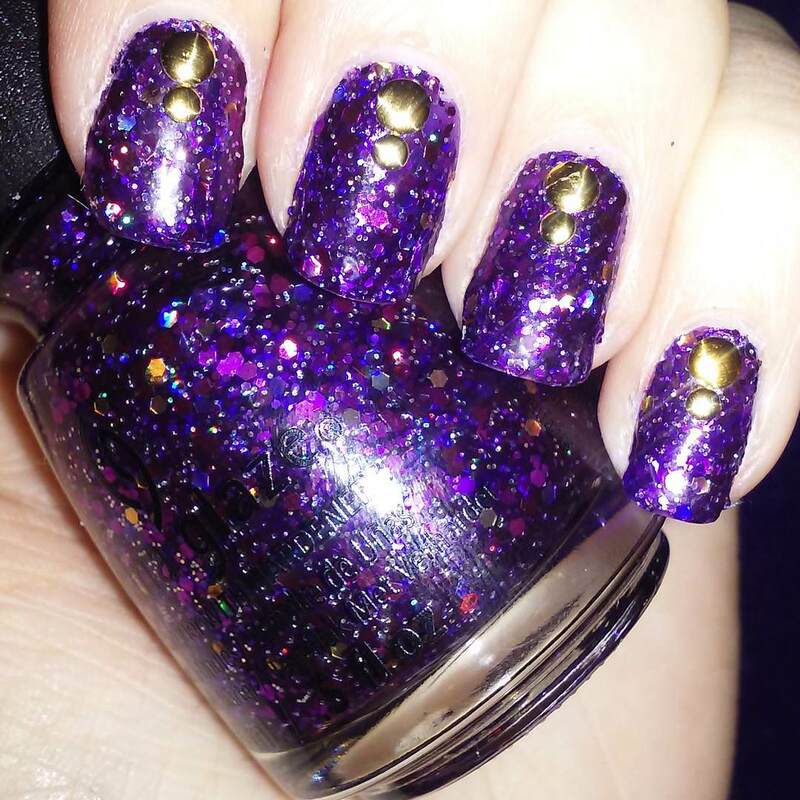 A Dash of Glitter: Amongst all of the awesome purple nail designs, the one which never ceases to get attention is purple glitter nails. 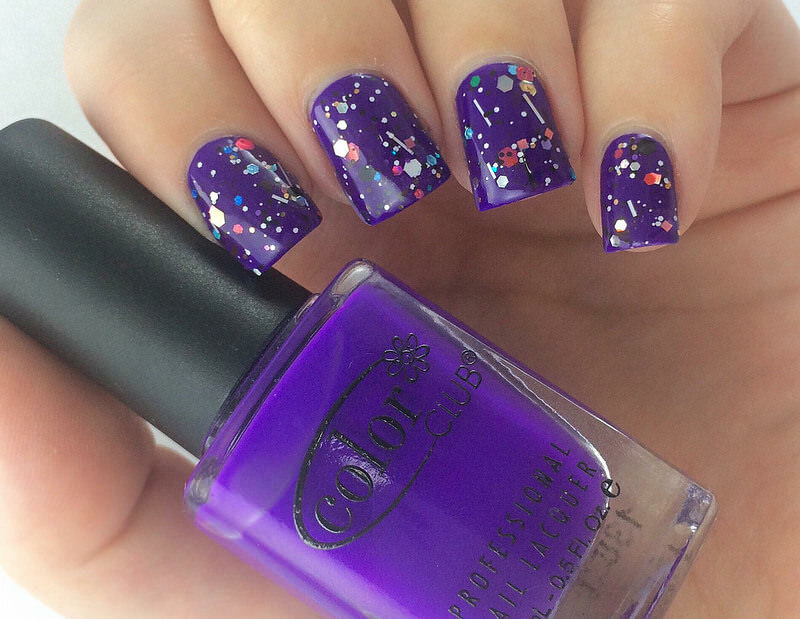 If you’re a purple person, then use any simple purple nail polish, incorporate some glitter, and you have your nails ready! 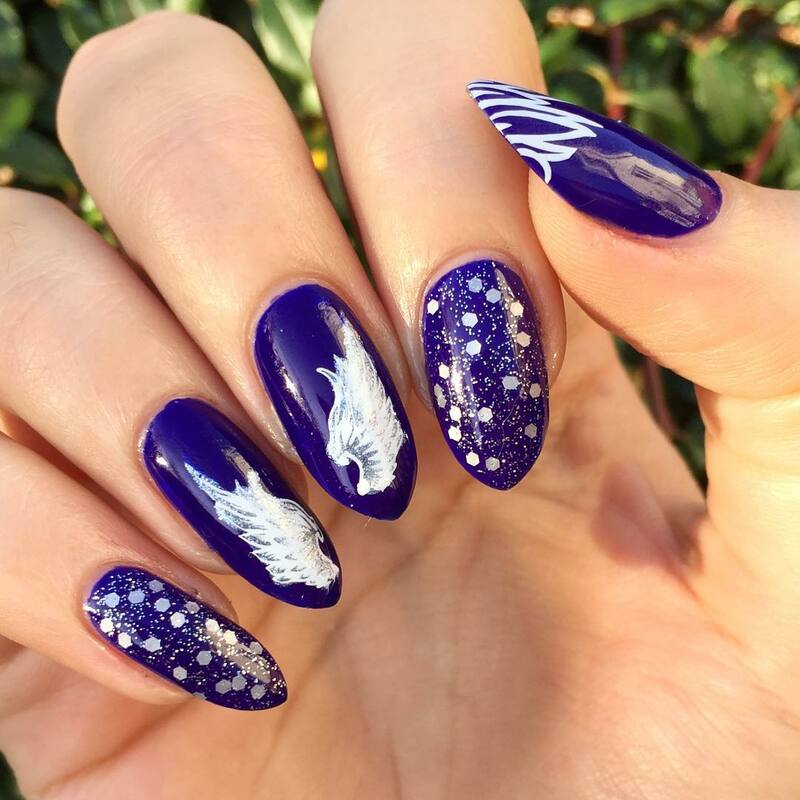 For French Tips: If you’re a person who has French tips and wants to paint them purple, we’d recommend you do some intricate white art against purple background. Sure-shot success, this design is! 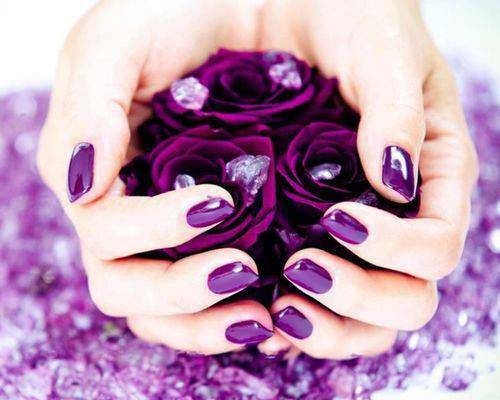 Purple Floral Nails: Want to steal the scene with your nails, try this: Paint all of your nails dark purple, except one. On that nail, use your nail art brush, some good quality paints and craft a floral nail design! 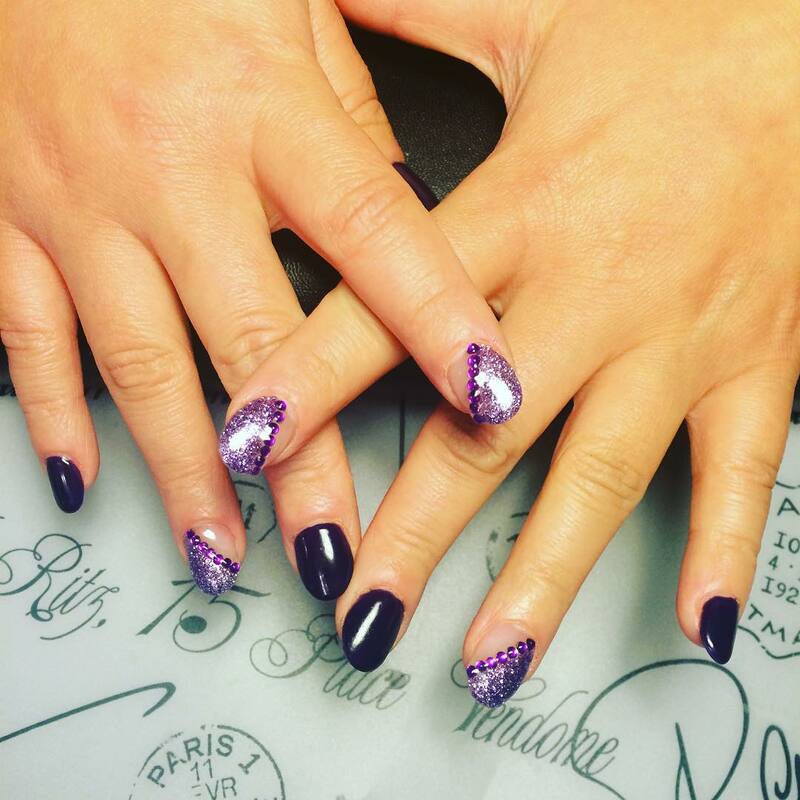 Abstract Purple Nail Art: Love abstract designs? Good news is they look awesome in purple. Abstract purple nail designs are quite hot these days. Add some Aztec patterns and you can finish it off with some matte effect. Purple Leopard Nails: Animal prints as nail designs is just amazing. Try doing leopard nail art using purple and black! This color combination totally works magic for drawing animal prints on nails. Purple Abstract Floral: Take the abstract floral route to add more interest in your nail art. 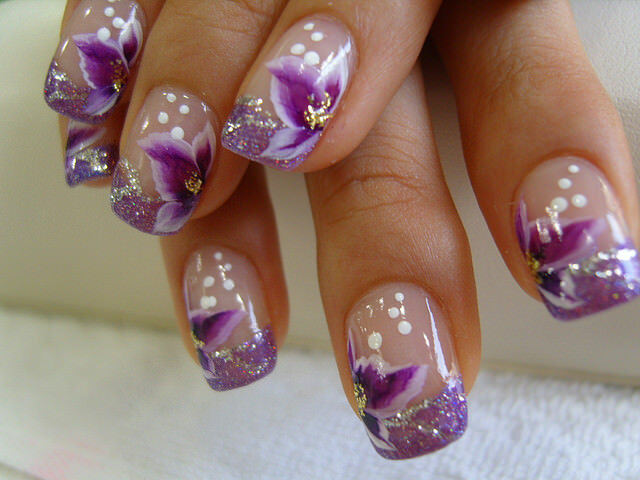 Use different shade of purple and create abstract floral nail designs. Purple Bling: Celebs do a lot of bling on their nails. 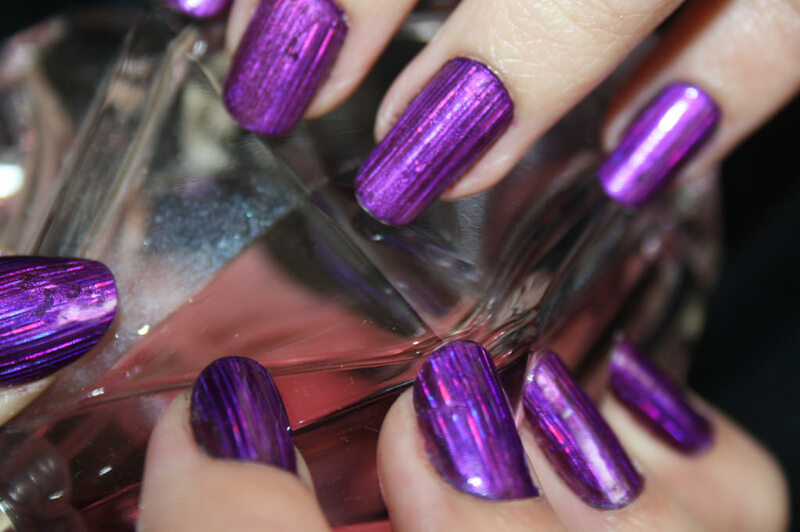 You should try doing some purple bling on your nails too! 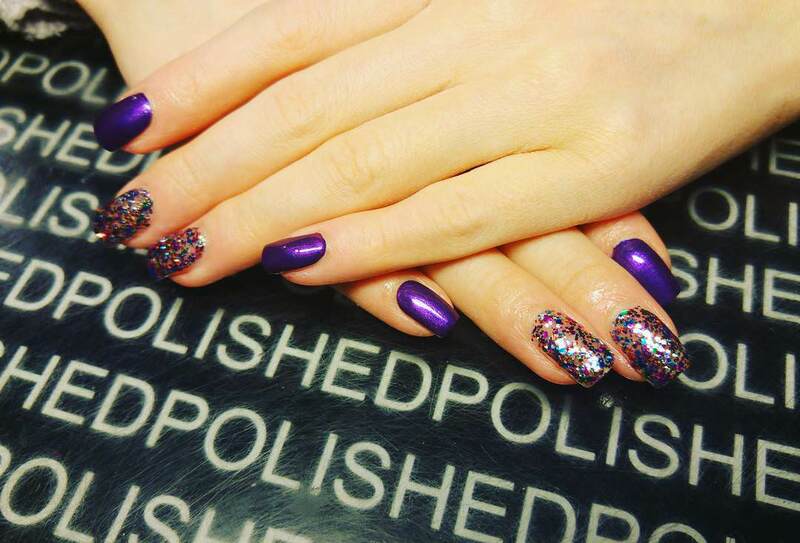 Use a lighter shade of purple and add nail art crystals on top to complete the look!